CBSE Class 10 Previous Year Papers: With CBSE Class 10 board exams knocking at the door, students must be wondering how to go about with their CBSE Class 10 preparation at this last moment. While the revision of whole CBSE Class 10 syllabus is a must at this stage, students must also solve CBSE Class 10 previous year question papers. This is important for students to get a feel of how the actual exam will be. In this article, we will provide you with CBSE Class 10 previous year papers for all subjects – English, Hindi, Social Science, Science, and Maths. Read on to find out. Taking CBSE Class 10 previous year papers will help students build concentration and stamina to sit for the full time of the exam. So, you must solve Class 10 previous year papers of CBSE and take your CBSE Class 10 preparation to the next level. How To Take CBSE Class 10 Previous Year Papers? Step 1 – Download the CBSE Class 10 previous year paper that you want to take. Step 2 – Take the exam seriously just like you would take the real exam. Step 3 – Evaluate your paper – mark the questions you couldn’t answer or get incorrect. Step 4 – Revise the related concepts and topics. We hope the CBSE Class 10 previous year papers help you in your preparation. 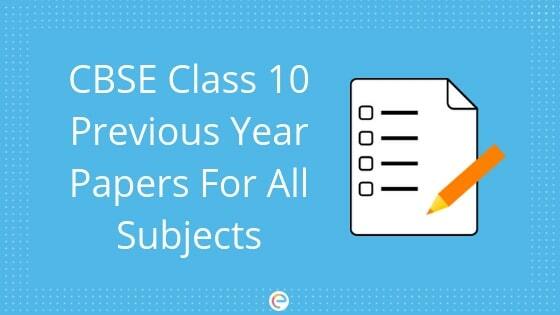 If you have any query regarding CBSE Class 10 previous year papers, drop a comment below and we will get back to you. It will be so grateful if i get anwser key for maths 2012 , 2014 question papers. The questions paper details cannot be segregated chapter wise. Kindly go through the detailed syllabus mentioned in the article. Apart from that, to crack the exam easily, it will be beneficial if you gain expertise in each and every part of the syllabus. Please send the solution of all papers for the year 2018 and 2017 and for maths send detail solution. Thanks. Yes Gukull, We have only provided the question papers. We have not included answer key in this article. Hi Kuhoo, Thanks for appreciating the efforts of our writers. We wish you all the very best. It was my pleasure helping you. Kuhoo! May I get the Previous Year Question Papers of English Communicative…. It would help me a lot.. It ‘s our pleasure helping you. thank u so much …. These papers are 100% genuine and checked. Embibe always gets you the best and genuine products to aid you in your preparation, Hence, you can totally depend on the question papers given here. Hey Vishal, As of now we don’t have answer keys for this previous year papers. Hey Nithin Raj we are working on solutions. Once it is updated we will let you know.